The top ten list of the West Midland’s most popular schools is dominated by six grammar schools. 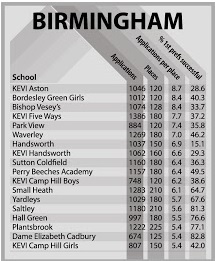 The school proving to be the most popular this September across Birmingham, Dudley, Sandwell, Walsall, Wolverhampton and Solihull was King Edwards VI Aston – which was deluged with 1,046 applications for its 120 places. It meant almost NINE pupils were vying for each of its places.